Van der Vorm-Croughs focuses this translation study on the processes leading to pluses and minuses including linguistic and stylistic aspects (i.e., cases in which elements have been added or omitted for the sake of a proper use of the Greek language), literary aspects (additions and omissions meant to embellish the Greek text), translation technical aspects (e.g., the avoidance of redundancy), and contextual and intertextual exegesis and harmonization. 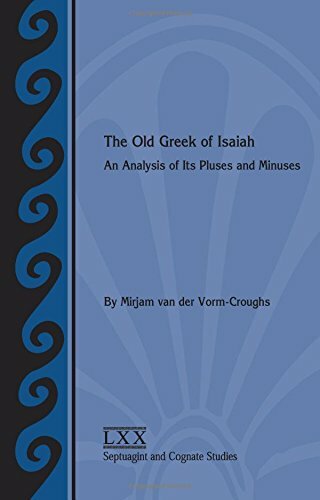 This work also covers the relation between the Greek Isaiah and its possible Hebrew Vorlage to try to determine which pluses and minuses may have been the result of the translator's use of a different Hebrew text. If you have any questions about this product by SBL Press, contact us by completing and submitting the form below. If you are looking for a specif part number, please include it with your message.